Most visitors to Ikaria come to realize that the island and its people exist beyond the normal concepts of time as we are used to in the modern world. 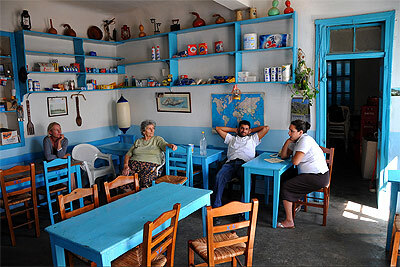 The Ikarians tend to live at their own pace and visitors to the island must be aware of this. For example, if a shop owner happens to wake up at 15:00 and open his/her store at 18:00, so be it. Their mentality goes, it's their life, and their store, and there is no need to live life bounded by the 'anchos' (stress) that obeying and serving others is one's prime purpose. The slow and moderate development of tourism on Ikaria has indeed created a slight shift in this area, so one can now find essential services like pharmacies and minimarkets open from maybe around 10am, but most Ikarians are not reliant on tourists (in contrast to the rest of Greece that thirsts for visitors with thick wallets). This is not due to the "Ikariotes" being unfriendly - quite the opposite. Ikarians are open, relaxed, down to earth and passionate people who greet you with a genuine smile and say hello to you when you drive or walk past them. Ikarians have always been self-sufficient people, mainly shepards, farmers, fisherman, shop owners and craftsmen. They farm their own land - with most households growing their own supply of organic fruit, vegetables and herbs. Youths start learning to harvest the land and herd goats and other animals, as well as other traditional labour, as early as their adolescent years. Young men and women work hard and see it as a way to carry on their heritage, rather than a nuisance that prevents them from spending hours on the internet or in cafes in Athens. A small but growing percentage of the population is employed in tourism, and the tourist services of the island are low key, evolving and improving yearly. 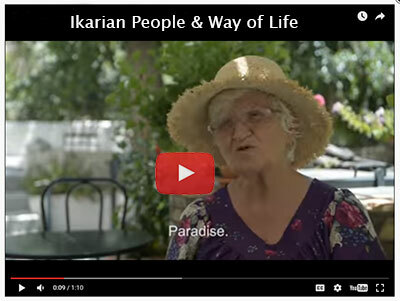 Ikaria has a permanent population of approximately 8,500 inhabitants and the majority of them lead a traditional way of life. Visitors are always impressed by the seductive oddity of Ikaria. The island is part of the Cyclades group and is in stark contrast to all of its neighbors: naturally abundant but very touristy Samos to the east, expensive and glitzy Mykonos to the west, historical and cultured Chios to the north and barren, religious Patmos to the south. Ikaria is blessed by rugged, verdant landscapes, a plethora of rivers, waterfalls, gorges, giant Neolithic-style boulders perched tentatively atop hills, cool turquoise waters and a series of stunning sunsets that blend the sea and the sky into a beautiful mixture of colors and light. Ikaria has mainly Greek visitors in July and August, and has remained off the mass market tourist map. Avoid visiting in August if you can. Ikaria seems to laugh in the face of modern life- the greedy rush through time, the loss of identity through globalization and homogenous life styles, consumerism, materialism and an official, or unofficial police state that observes and dictates the rules of living where there is meant to be freedom. In the village of Raches, the police station that had been built has remained unused for the last seven years after the villagers got together and agreed that they didn't want or need policing - they do it perfectly well themselves. Yet the island remains one of the safest places to live with crime virtually non-existant. Local as well as foreign residents, men and women feel safe and free to live as they like. 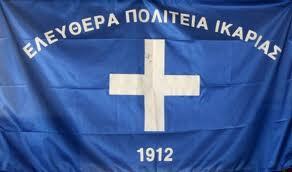 This independent way of living can partially be attributed to the fact that Ikaria was independent of Greece itself for a around seven months in 1912. When the island broke free of Ottoman rule it was not immediately reabsorbed into Greece because the latter was deeply embroiled in the Balkan Wars. The treaty that it signed with Greece at that time expired in 2012, and in true Ikarian Spirit many locals old and young campaigned for the opportunity to regain their independence as a state once again. Recently Ikaria became internationally noted through an ongoing health project called Blue Zones (www.bluezones.com), run by Dan Buettner. Buettner visited the island to research why it is one of the few exemplary locations in the entire world where people live such long, balanced lives. In his reports he attributes longevity on Ikaria mainly to diet and lifestyle, as well as owning rather than being owned by time, as most stress-ridden people around the world are today. He writes: "our team has discovered that over one-third of everyone living in the northeastern end of the island reaches age 90. They suffer 20% less cancer and half the rate of heart disease. And there's virtually no dementia. In other words, they're living the good years many of us are missing." A minimal consumption of meat and dairy and a greater consumption of beans, nuts, (home-grown, organic) fruit, vegetables, herbs, honey and olive oil seem to make a huge difference to lifespan as well as quality of life, as does their relaxed sense of time, festive spirit (dance and song) and physical work in the great outdoors. Until the 1960s Ikaria was vastly neglected by the Greek state, and left much to care for itself; in fact locals relied on help with essential resources from their compatriots in the US rather than in the Greek capital. Literacy, however, may be overrated as an ingredient for a healthy life, as conversation about everything from philosophy and politics to history and society is easily enjoyed if you sit in the village square. The island is also famous for its tradition of panagiria, or festivals. Between May and October, the island is famed for hosting between two and four such events per week. 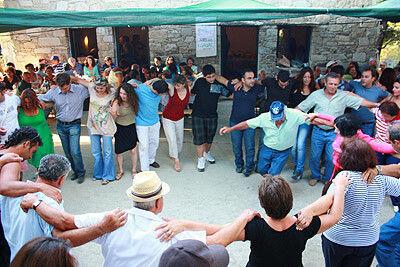 The panygiria, which are usually held in various parts of Greece to celebrate a major religious holiday, such as the most major of all, the 15th of August celebration of the assumpion of the Virgin Mary, in Ikaria are held almost gratuitously, for the sake of gathering communities and visitors for all-night dancing and feasting on boiled or grilled goat, garden salads and 16% proof red wine. The proceeds mostly go to the village church or for improving the village's infrastructure, like road-building. Ikaria is named after Ikaros, who according to Greek mythology was the son of master craftsman Daedalus, and who was escaping imprisonment from King Minos in Crete by flying with wings his father had made. But ignoring his father's advice, Ikarus flew too close to the sun and landed to his death on the island. There is something about this myth that provides a sense of understanding of the spirit of the people and of the dramatic, lush and vibrant landscape, where communists were exiled during the Greek Civil War. Ikarus was flying with false wings to escape imprisonment by a tyrannical but powerful and civilized king, a life of captivity, and he died by landing on the island. The island has become infused by his spirit of escape to freedom and the bravery of taking flight. Ikaria has a permanent population of approximately 8,500 inhabitants and the majority of them lead a traditional way of life. The main areas of employment are agriculture, livestock farming and, to a lesser degree, fisheries. A significant proportion of the population is also occupied in the commerce sector. A still small but growing percentage of the population is employed in tourism, and the tourist services of the island are low key, evolving and improving yearly. 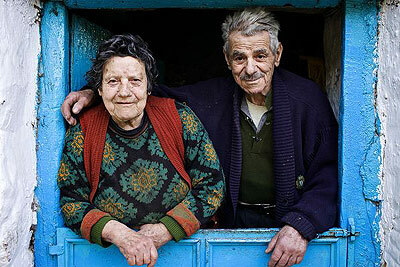 Ikarians are a people with a rich history who have endured many hardships throughout the ages. They are down to earth, industrious, hospitable, independent, energetic, playful and humorous. They were occupied and influenced by a multitude of empires, conquerors and societies from the East, Ionia and the broader Aegean region, but by and large they have managed to keep intact most of their indigenous customs, culture and traits, and they are proud of that. One example of this is the fact that many inhabitants of the island unfold their everyday activities during the night. 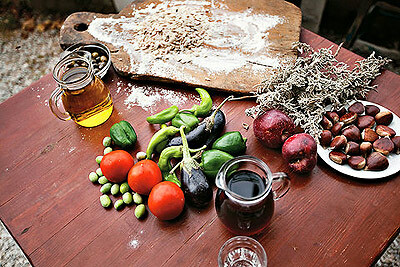 People who have studied Ikaria relate these habits with the people's way of life during the long years of obscurity. Christos Rachon is one of the most striking examples of a village living in such a way where shops open around midnight and stay open almost until dawn. Ikarians are known for their hospitality to visitors and people in need, even when they have limited resources. In former times, before the island had a road network or sea links, moving from island to island or village to village was difficult and time consuming. Ikarians always opened their homes to visitors and travelers and offered them food, drink and a place to sleep so they could continue on their journey. This peculiar hospitality continues today and makes visitors feel welcome, cared for and a part of the Ikarian way of life.